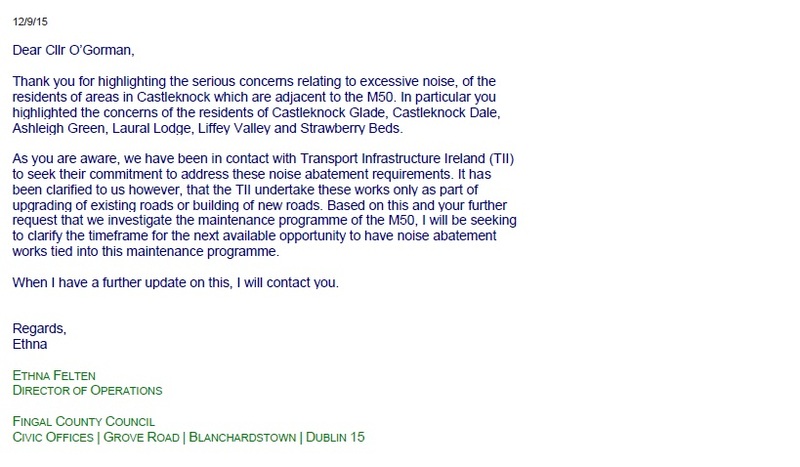 Residents in Laurel Lodge and along the M50 must not be subject to continuous noise pollution. 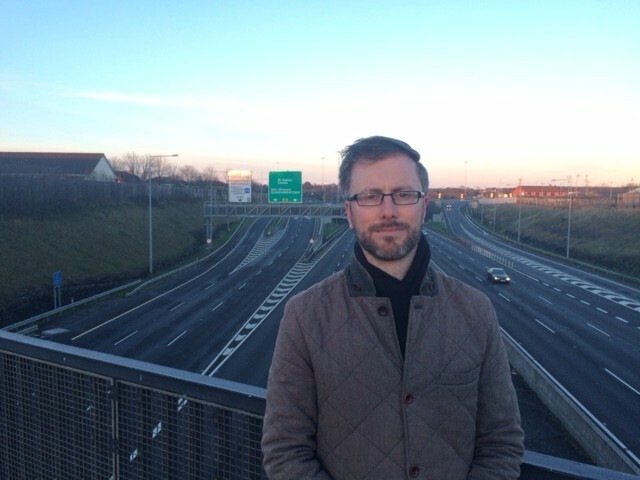 Since getting elected to the Council, I’ve been working to get Transport Infrastructure Ireland to take steps to commit to residents living along the M50 that it will reduce noise pollution coming from the Motorway. Transport Infrastructure Ireland is the body that has taken over responsibility for roads and motorways from the National Roads Authority (NRA) in the last 6 months. In September 2014, I and other local councillors attended a public meeting arranged to discuss the persistent noise and air pollution issues being generated by the M50. Since then, I have been pursuing the issue within Fingal County Council, and successfully lobbied to get a noise monitor installed in the area. I have repeatedly attempted to get the National Roads Authority to attend a meeting of the Council to answer questions about the pollution issues and how they can be addressed. The NRA has now been restructured into a new organisation called Transport Infrastructure Ireland (TII). 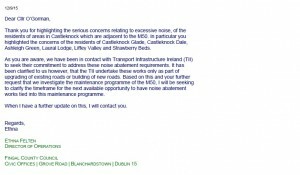 At my request, Fingal’s Director of Services for Operations, Ethna Felten, wrote to TII regarding possible measures to reduce noise and air pollution along the M50. At this time, TII are taking the position that they only have to undertake sound-proofing works on new roads or when works are being undertaken on an existing road”. Currently, I am focusing on achieving two specific goals. Firstly, I want Fingal to secure a commitment from TII that when they are next resurfacing the M50, they will use a noise reducing surface, such as is used at the Newlands Cross bridge, along the entire Dublin 15 section. Secondly, I have a motion down to insert an objective in the new Fingal Development Plan, which is currently being drafted, that noise reduction barriers would be installed along the Laurel Lodge boundary. While the M50 is a hugely important piece of transport infrastructure, it is not fair that those living close to it should have their quality of life affected, particularly since it was widened. Transport Infrastructure Ireland must take basic steps to reduce the noise levels for people living along the most noisy sections, particularly at Laurel Lodge and Diswellstown. My nsne is Aidan Dempsey and I live in No 8 College Gate, Castleknock. I note from your exchanges with Fingal CoCo that there is no mention of sound proofing measures for our estate. Some of our houses and especially my own are less this. 100M from the M50. We have been enduring a living nightmare. The noise has reached such levels that it is not possible to have a conversation in our back gardens. One of my neighbours placed a glass of clean water on a table in his back garden and it gathered significant quantities of smuts and particulate emission material within a short period of time. This has serious health implications for us and especially young children. Does The Depts. of Health, EPA and indeed Health & Safety not have some responsibility in this matter. All we are been given is so called mapping and meetings and plans. This sort of codology has been going on for far too long.Toll roads in this country generate enormous amounts of cash of which a very small %age would help to mitigate some of these problems. On a stretch of N11 which runs by the well known Jack Whites Pub it is quite conspicuous how the road surface has impacted on the noise levels. We also get the rubbish that the TII are only responsible for action when the roads are being resurfaced or “maintained”. When is this supposed to happen? Why was it not attended to when the M50 was last resurfaced? Will it take a public protest to get something happening. I share your frustration and that of other residents living in estates close to the M50. I live close to the N3 in Blanchardstown village which generates significant noise (though not as close as you are to the M50). Two key pollution issues: noise and air/particulate matter. As regards the noise pollution, since Fingal passed its new Noise Action Plan, they have meetings with Transport Infrastructure Ireland (who run the M50) scheduled. I’ll be getting an update on these at the Council meeting next week. I’ve been pressing the Fingal officials to ensure that top of the agenda is a) a commitment that when the M50 is next resurfaced, a noise absorbing surface will be used and b) a date on when the next resurfacing will take place. On the air pollution, I’m looking into the degree of monitoring in D15. The EPA has a monitoring station, but that undertakes very generalised monitoring of gas levels. I don’t feel it can give locality specific measurements, which is relevant to particulate matter coming from a specific source such as the M50. I’ll post a link to the report on the noise pollution stuff next week.